In the Southwest Indian Ocean, the use of animal-borne cameras on sea turtles started in 2015, with a total of 29 devices deployed on juvenile green and hawksbill sea turtles at four different study sites in French overseas islands: the Glorieuses Archipelago, Juan de Nova, Mayotte, and Reunion. To recover the cameras and avoid the loss of valuable and reusable equipment, researchers also successfully tested and deployed automatic releases and VHF radio tracking devices. Since 2017, researchers have also used 360-degree cameras anchored to the sea bed as a complement to the turtle-borne cameras in key sea turtle resting and feeding habitats in Reunion and Glorieuses. 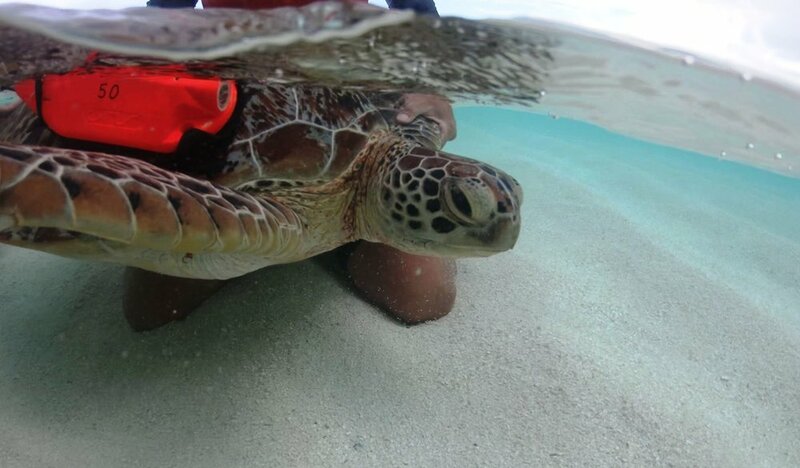 The anchored cameras decrease the potential data biases that may arise from the presence of cameras attached to the turtles. Thus far, the ongoing studies have yielded more than 115 hours of video footage using 360-degree cameras (with an average of 6.5 hours per deployment) and 142 hours of turtle-borne camera footage (with an average of 15.5 hours per animal). Results so far have provided valuable insights into sea turtle behavioral ecology, diets, and habitat preferences, and those results have captured rarely reported activities, such as green turtles scrubbing and burying themselves on the sandy seafloor, unexpected social interactions between sea turtles, and predator interactions. In addition, anchored 360-degree cameras provided researchers with the unique opportunity to individually identify dozens of turtles using photo identification (PID) methods without having to capture the animals. Another important benefit of using turtle-borne cameras has been the generation of footage for conservation outreach and awareness efforts. Several video sequences were combined into a powerful short film called “Eye of the Turtle,” which was shown at numerous special events in support of sea turtle and ocean conservation and is now freely available for online viewing. On Reunion Island, footage gathered using 360-degree cameras is being incorporated into a three- dimensional documentary in which the audience becomes actively engaged through the use of virtual reality headsets, thus creating a “wow” effect and an immersive experience of the life of a sea turtle. With further technological advances— such as improved camera functionality, data storage, battery capacity, and miniaturization—researchers will be able to collect video footage across different species, life stages, and habitats. By increasing the understanding of sea turtle habitat use, of foraging, and of behavioral ecology, researchers can help conserve these endangered populations.